There was a time when angels were mainly relegated to Christmas cards. But not anymore. Angels have infiltrated the popular culture - big time. Indeed, interest in angels is virtually soaring across the religious spectrum in North America - from mainline Christians to New Agers who seek comfort from these heavenly helpers in a troubled and often chaotic world. Some of today's most prominent magazines are running feature stories - even cover stories - on angels, including Time, Newsweek, Ladies' Home Journal, and Redbook magazine. Moreover, in mid-1994 ABC aired a two-hour prime time special entitled Angels: The Mysterious Messengers, hosted by Patty Duke. Today there are angels-only boutiques, angel newsletters and magazines, angel seminars and college-level courses, angel T-shirts, calendars, postcards, sunglasses, jewelry, and an angel Broadway play. Moreover, according to Publishers Weekly, at one time during 1993 five of the ten best-selling paperback books were about angels. Newsweek magazine asserted in late 1993 that "angels are appearing everywhere in America." The magazine noted that "those who see angels, talk to them, and put others in touch with them are prized guests on television and radio talk shows. Need inspiration? There are workshops that will assist you in identifying early angel experiences or in unleashing your 'inner angel.' Tired of your old spirit guide? New Age channelers will connect you with Michael the Archangel. Have trouble recognizing the angels among us? Join an angel focus group." In a poll conducted by Time magazine in late 1993, 69 percent of American adults confirmed their belief in angels. Forty-six percent acknowledged a belief in their own personal guardian angels. Thirty-two percent claimed to have felt an angelic presence at some time in their lives. Such statistics may well cause one to wonder. Why Are Angels So Popular Today? Among the major contributing factors to the angel craze among Christians in the early 1990s were Frank Peretti's mega-best-selling fiction books - This Present Darkness and Piercing the Darkness - which graphically depict behind-the-scenes angelic intervention in the lives of believers. Regardless of what one may think about the sensationalistic nature of these books, they certainly served to bring angels to the forefront in the minds of numerous Christians. Earlier, many had received a biblical crash course on this fascinating subject by reading Billy Graham's book, Angels: God's Secret Agents, which became one of the hottest-selling religious books of the 1970s. New Agers have more recently become almost fanatically excited about angels because they have bought into a plethora of wildly unbiblical ideas about angels that nevertheless have great appeal in today's religious climate. One reason cited for angel popularity in New Age literature is that angels offer people a spirituality that does not involve commitment to God or His laws. Sophy Burnham, author of A Book of Angels, believes the current popularity of angels is "because we have created this concept of God as punitive, jealous, judgmental," while "angels never are. They are utterly compassionate." Or, as Time magazine put it, "For those who choke too easily on God and his rules...angels are the handy compromise, all fluff and meringue, kind, nonjudgmental. And they are available to everyone, like aspirin." Angels can also bring meaning and purpose into our lives, New Agers tell us. Author Terry Lynn Taylor says, "These angels 'make life worth living,' so to speak. They provide us with unconditional happiness, fun, and mirth. They also help out with romance and wealth. And they help us extinguish worries that plague our lives." Angels are "heaven-sent agents who are always available to help you create heaven in your life." Guardian angels have become especially popular among New Agers in recent years. The Los Angeles Times reports that "times have gotten so bad that guardian angels are turning up in individual's lives with increasing frequency, and people are more receptive to the heavenly beings than ever before." John Ronner, author of Do You Have a Guardian Angel? agrees: "People find a great deal of comfort in the thought that something larger than themselves and benevolent may be looking out for them." Some New Agers believe angels in general have become popular as a direct result of their increased activity in recent years: "We are approaching the millennium. We're at the end of a century that has seen unbelievable horrors...and the angels are saying people can't be allowed to live like this any longer." Robert C. Smith, author of In the Presence of Angels, says they are here "because of the difficulties we're encountering during this time of transition. The gateways to a new period in history have opened, bringing forth fresh possibilities for higher consciousness around the world....The angels are here to help us with that passage and to protect us if all else fails." Angel enthusiasts also assure us that angels can help us cope with death. In their encounters with angels, humans "gain experimental assurance that they, too, have a heavenly home." Burnham affirms that "we need not be afraid to die....We do not die! This I have learned. This much I have seen with my own eyes." The angels have shown her this. Probing deeper for a root cause, some angel enthusiasts have insightfully suggested that angels have become popular as a reaction against the secularism of Western society. "I think Americans in the '80s became weary of 20 years of materialism," Burnham muses. "We were spiritually starved and hungry for some hope and inspiration. I think that's why Angels continue to be such a success." Eileen Freeman, author of Touched by Angels, agrees: "We've come through a very materialistic period in this country. People are searching for a deeper spirituality." Though I disagree with much of what Burnham and Freeman say in their books, I think they've made an important point here. The fact is, new religious trends and currents are not born in a vacuum; they often grow out of social and individual needs that are in themselves legitimate. The human need for transcendence is an example. Without going into detail, it is enough to note that for many years secular humanism focused so much on the all-sufficiency of humanity that God was left entirely out of the picture. Many people experientially discovered how easily secular humanism can lead to nihilism - the belief that everything is meaningless and absurd. As secular humanism reigned supreme, Westerners increasingly lacked a sense of the transcendent - something people yearn for in the deepest part of their being. The inadequacy of secular humanism made people crave for something more - something divine, something sacred. What should be of concern to Christians is that in reaction to Western secularism, many today have found a new sense of the transcendent by relating not to God but to God's angels - not to the Creator but to the Creator's celestial creatures. Of course, prior to the current angel craze many found (and continue to find) a sense of the transcendent in the broader New Age movement. As we will see, the current angel craze fits comfortably under the umbrella of New Age spirituality. These "angels" seem right at home with the Ascended Masters and the "space brothers" aboard UFOs, all of whom seek to lead humankind into a New Age of enlightenment and harmony. Today one can hardly keep up with the seemingly endless flow of New Age books setting forth different methods for making angel contact. Popular methods include channeling, prayer, meditation, visualization, crystals, writing letters, and color-coordinating one's wardrobe. Let's take a brief look at these methods. Channeling. New Agers believe they can contact angels directly via channeling (spiritism). One representative New Age channeler offers clients "angel listenings." A typical "listening" lasts somewhere between 20 and 30 minutes, and is really nothing more than a conversation between the counselee and his/her channeler, through whom the counselee's angel is supposedly speaking. After going into a trance, the channeler writes down everything the angel relays to him or her using a pencil and pad. The counselee never actually hears the angel speaking, though some have claimed to see a glow of light or to sense a presence in the room. Prayer. Others prefer contacting angels through prayer. Taylor says, "Prayer is the way we talk to angels....When you pray to the angels, pray as if 'it is already done'; in other words, thank the angels in advance for taking care of your burdens." Incidentally, angel altars, which New Agers use for prayer and meditation, have become a hot item in today's angel-only stores. Meditation/Visualization. Meditation and visualization - both used to induce an altered state of consciousness - are popular means of making angel contact. Robert C. Smith explains that "as we practice withdrawing our attention from the physical world and focusing it on the spiritual, our perception becomes less limited to materiality. The nonphysical realm becomes more real to us, and we develop the mental habit of attentiveness to it." Smith adds, "the tendency of material concerns [interferes] with our receptivity to the angelic realm." Crystals. A "cherubic crystal" can be of great benefit for one seeking contact with angels, we are told. A cherubic crystal is one that has been "activated in meditation and which has been charged by the Cherubim." Once you have selected a suitable crystal, "hold it between the palms of your hands. Ask out loud for the wisdom vibration emanated by the Cherubim to flow through you and into your hands so that the stone will become charged with the Cherubim's vibration. Prepare the crystal once in this manner and you will never have to do it again." The crystal will then attract Cherubim angels into your life. Writing Letters. Another (alleged) great way to communicate with angels is through writing letters to them. All one has to do is "date your letter, write 'Dear Angel,' and just let your words flow....Then sign it at the end as you would a letter to a friend." The letter can be "mailed" by placing it on a meditation altar, under one's pillow, or, perhaps, one may burn it, "sending the message up to the heavens with the rising smoke." Wearing the Right Colors. Still another way one can hail an angel is to color-coordinate one's wardrobe. Guardian angels allegedly like rose or pink and soft green; healing angels like deep sapphire blue; seraphim angels like crimson red; cherubim angels like blue; the archangel Michael likes deep green, vivid blue, gold, and rose; and Gabriel is attracted to tans, browns, and dark greens. By wearing specific colors, one can attract specific kinds of angels into one's life. Assuming one is successful in using one of the above methods to make angel contact, what form might that contact take? New Agers tell us angels can appear as animals and humans, male or female, visions or voices, and with wings or without. They can take the form of nudgings, intuition, or coincidence. They can appear as light on the water, or in clouds and rainbows. It is also possible, we are told, for an angel appearance to be disguised in everyday events. We are therefore urged to pay attention to the subtleties in life. For example, a child may spontaneously blurt out a statement for which only you know the meaning. While thumbing through a book, a page may fall open with a clear message in the print. Headlines in the newspaper, taken out of context, might contain your message. If the current New Age literature is to be believed, angel contact reaps all kinds of benefits. Following are some notable examples. Spiritual Guidance. New Agers believe angels have a mission "to help us grow in wisdom and love, not just so that we will survive as a race, but so we will be able to grow into what we were always intended to be - perfected beings capable of incredible energies and immense, transforming love." These angels seem similar to what New Agers call "Ascended Masters" -formerly historical persons (including Jesus, St. Germaine, Buddha, and Lao Tze) who have allegedly super-evolved and "ascended" to a higher plane of existence from which they now assist other humans to evolve. Attainment of Goals. New Agers tell us we can make a "declaration" to the angels, who will help bring about what we desire in life: "Making a declaration to the angels means that you are openly announcing what you want known to heaven. Declaring your goals and statements of things to come will establish a plan of action with the angels....The angels will bless the declaration and add higher inspiration and aspirations to it." This sounds like a celestial form of "positive confession" - angel-assisted "name it and claim it." "Brain Program Editors." Angels can allegedly help our emotional and psychological state by functioning as "brain program editors." These editors are "tiny angels of light that have access to cells and neurotransmitters [in our brains] if we allow them to. They can help us transform negative beliefs to positive ones and 'addicted' cells to free cells." Hence, angels are immensely practical because they can literally change the way we think! Comforters. If we trust the angels, they can "comfort us with invisible warm hands, and always they try to give us what we want." As well, the angels can function as a cheering squad for our higher selves. "These angels cheer with little voices, 'Don't give up... We like who you are... Everything's going to be okay... We are proud of you.'" New Religious Experiences. Some angel writers believe that when a new angelic guide comes into a person's life, he may acquire a desire to know something about a particular culture or religion that was previously foreign to his experience. If, for example, one of this individual's angelic spiritual guides is from a Native American background, he may find himself having visions that put him in touch with Mother Earth. Michael the Archangel is said to be a strong proponent of free thinking, and he allegedly encourages people to create their own religions. "Michael sends us inspiration that urges us to open our minds to new ways of thinking and encourages us to figure out for ourselves where we need to be and how to get there. Creating our own religion can help us free our thinking and figure things out for ourselves." "Copilots." Angels can also "copilot" our lives. Indeed, "if you ever need them to take over, they are ready and capable....Copilots act as your invisible secretaries, arranging and ordering your days so that you don't have to make extra trips, reminding you about appointments and deadlines you are about to miss in your confusion." Therefore, we should "let go and let angels." The Reformer John Calvin once said that the error in much angelology is to deal with angels apart from the biblical witness. This is precisely what has happened on a popular level today. Many of the best-selling angel books contain legend, lore, and outright occultism, but pay little attention to what God's Word teaches on the subject. We will now use the Bible as our standard of truth in briefly evaluating the "angels" of the New Age. At the outset, let us note that an implicit assumption on the part of many angel enthusiasts today is that all angels are good. Indeed, "there is a prior assumption that angels are only good and therefore contacting them is also only good (and consequently without risk)." To New Agers, every paranormal event is a good and positive event. However, as critic Gary Kinnaman puts it so well, "Not everything that glitters is heavenly gold. Not every bright angel is from heaven." In 2 Corinthians 11:14 the apostle Paul sternly warned that "Satan himself masquerades as an angel of light." Satan and his horde of demons (fallen angels) mimic God's holy angels, and they do so for a malevolent, sinister purpose - to lead people away from the true Christ and God of the Bible (see v. 3). In the process of doing this, they propagate doctrines of demons (1 Tim. 4:1-3). Part and parcel of this system of demonic theology is today's New Age angelology. The apostle Paul explicitly warned against accepting any "gospel" from an "angel" that goes against the inspired Word of God (Gal. 1:6-8). One would do well to remember that Joseph Smith, the founder of Mormonism, said an angel named Moroni led him to the golden plates containing the Book of Mormon. As well, Muhammad claimed he received the revelations contained in the Qur'an directly from the angel Gabriel (a demonic impostor). We know from the Scriptures that Satan and his fallen angels seek to thwart the purposes of God and Christ (Rev. 2:10; 1 Pet. 5:8; Eph. 6:11; Matt. 13:39; 1 Tim. 4:1). We also know that fallen angels seek to blind the minds of people to spiritual truth (2 Cor. 4:4; 11:14; 2 Thessalonians 2:9-10). Tragically, many New Agers - assuming that human experience is a reliable source of truth - have undiscerningly and gullibly accepted all "angels" at face value without seeking to "check out their credentials" or consider their motives. Some in the church are said to possess a gift of "distinguishing between spirits" (1 Cor. 12:10). The need for this gift reminds us that not all spirits are good. Just because one has a seemingly positive experience with a spiritual being does not mean that that spiritual being is benign. We are therefore called to sort, sift, and test experiences (1 Thessalonians 5:21). We would do well to ponder what happened to the apostle John as described in Revelation 22:8-9. According to this passage, John beheld an incredibly glorious angel, and his first inclination was to bow down in worship before it. The holy angel immediately told him to cease such an idolatrous response and to worship only God. This event points to an extremely important consideration: spiritual experiences can be overwhelmingly powerful. And without a reference point to test such experiences (i.e., the Word of God), they can all too easily be misunderstood. If John nearly went astray due to his own human weakness in the overwhelming presence of a holy angel, how much more are they in danger of going astray who find themselves in the overwhelming presence of a fallen angel (all the while mimicking a holy angel) who is bent on their destruction! We are well advised to follow Calvin's advice in making the biblical witness our absolute guiding standard. Certainly the Scriptures allow that real spirit entities can be contacted via channeling and other occultic means, and these beings are capable of divulging paranormal information (see Acts 16:16-19). However, Scripture is consistent in portraying these entities as malevolent and deceptive. As New Age critic Elliot Miller points out, the information such spirit entities give "is such a supernaturally sophisticated mixture of truth and error that their followers are incapable of sorting it out, and thus become entrapped in a web of deceit." The current celestial web of deceit is a sinister mixture of truth and error indeed. For the angels of God do care about human spirituality - but not a spirituality without God (Rev. 22:9). Angels can give messages from God (Acts 10:3-33) - but not new "revelations" that contradict God's Word (Ps. 103:20). God may use angels to answer the prayers of believers (Acts 12:5-10) - but angels are not the object of prayer; only God is (Matt. 6:9). Angels can appear to humans (Luke 2:9) - but not "subtly" in newspaper headlines taken out of context. Angels do care about the death of believers (Luke 16:22) - but they do not propagate the idea that death is the next step in man's spiritual evolution. Angels do care about man's future (e.g., Acts 8:26; 10:1-8; 1 Pet. 1:12) - but not a future without God (or His laws) that involves a mystical and occultic New Age of enlightenment and harmony. In view of such doctrinal deception coming from channeled entities, it is not surprising that God absolutely condemns the seeking of any paranormal information through occult means (from "angels" or any other entities) as a heinous sin that is utterly detestable to Him (Deut. 18:9-12). God will have none of it! Note also that in Scripture we never find God's people attempting to make contact with an angel by channeling or any other means. In the Bible, the angels typically show up on the scene unexpectedly and startle the human spectator. 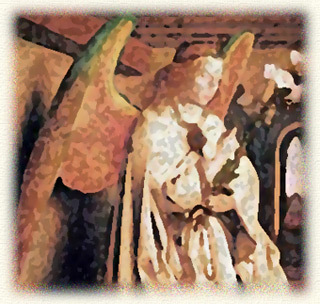 Christian critic Timothy Jones offers this sound advice: "We should be wary of angel visits that seem to come from someone's prompting or conjuring. Any visit that comes out of someone's effort to summon an angel is likely counterfeit... Angels in the Bible caught the subjects of their visits off guard. An angel visit that seems to come out of the blue stands a better chance of being authentic." New Age angelology centers on spirit entities that can not only be invoked but also be manipulated by human beings to bring about specific desired results. Instead of God being the Sovereign, in the New Age scenario it is humanity - in the guise of being God - that is sovereign over the angels. Such a system panders to human selfishness, pride, and the perpetual desire for self-exaltation (Isa. 14:12-14; Genesis 3:5). New Agers would do well to remember, however, that God does not look lightly on human pretenders to the divine throne (see Acts 12:20-25 for a graphic example). In contrast to New Age angelology, we get to the heart of the true identity of angels in Hebrews 1:14: "Are not all angels ministering spirits sent to serve those who will inherit salvation?" This brief statement is packed with meaning. The word "ministering" comes from a Greek word meaning "serve." Angels are spirit-servants who render aid, and this aid is rendered to the heirs of salvation in the outworking of God's purposes on earth. What form does this service take? Such ministry can involve protection (Ps. 91:11), guidance (Genesis 19:17), encouragement (Judg. 6:12), deliverance (Acts 12:7), supply (Ps. 105:40), empowerment (Luke 22:43), as well as occasional rebuke (Num. 22:32) and judgment (Acts 12:23). And angelic service is rendered largely unseen and often unrecognized (2 Kings 6:17; Hebrews 13:2). Notice that Hebrews 1:14 says angels are sent to render service to the heirs of salvation. God has specifically sent and appointed angels to carry out tasks on behalf of believers; humans do not invoke or manipulate them. We must never forget that angels assist us because God has ordained it that way. There is never any sense that the sent one is more significant than (or takes the place of) the divine Sender. God's angels act to carry out only God's commands. There's not a single Bible verse that portrays an elect, holy angel of God acting independently from God. Psalm 103:20 makes explicit reference to God's angels "who do his bidding, who obey his word." Because only God sends angels on our behalf, our focus of attention must ever be on the God who sends them. God's holy angels do not seek praise or worship for the things they do. In fact, they discourage it and point to God as the only one worthy of worship (Rev. 22:9). The apostle Paul flatly condemned the worship of angels in Colossians 2:18. God Himself explicitly commands that only He is to be worshiped (Exod. 20:5-6).